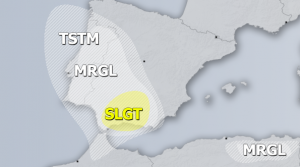 A new cyclone is approaching western Europe; it will cause gale to storm force winds across the Bay of Biscay and affect the northern coast of Spain and western coast of France over the next 24 hours. By early afternoon today, the low had already developed significantly, deepening to 1000 mb central pressure and deepening further, down to approximately 995 mb by the late afternoon. 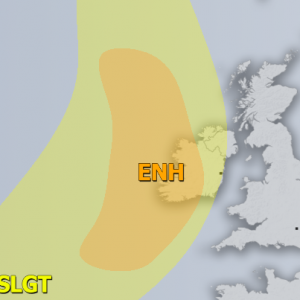 Latest high-resolution model guidance indicates the system will generate winds gusting up to 90-110 km/h. 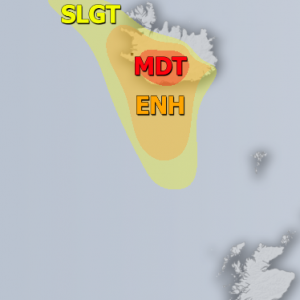 There is some marginal instability present, with up to 500-700 J/kg MLCAPE, so shallow convection is also expected; the main severe threat with these storms will be severe wind gusts, locally possibly up to 130 km/h. 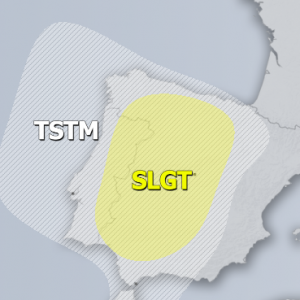 Most of the severe wind threat will be localized over the Bay of Biscay. 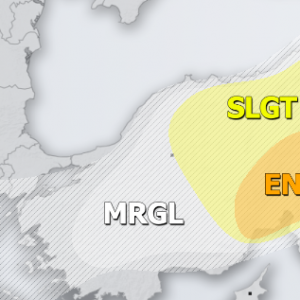 Some severe winds are possible along the coast and higher elevations of northern Spain and the coast of western France. Also, expect graupel showers with these storms. Peak wind gusts over W Europe today and early tomorrow; 0.01° AROME model guidance. Maps: Wxcharts.eu.